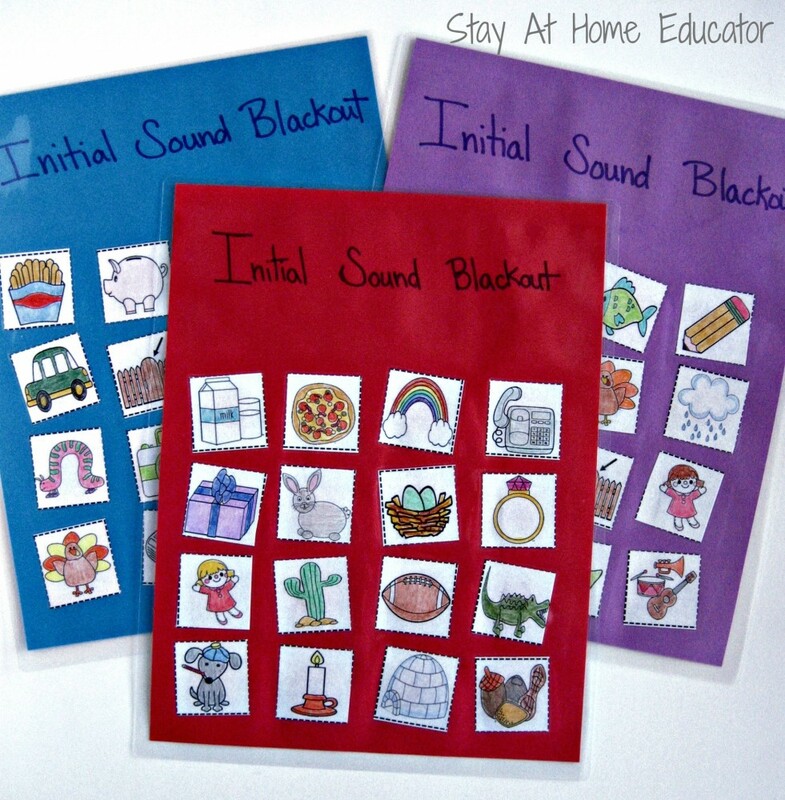 I LOVE sorting activities to reinforce letter identification and sounds. Such activities have been wildly successful with my preschoolers in reviewing those important beginning reading skills. Sometimes, though, it is appropriate to bring out something completely new, such as this game Initial Sound Blackout. I had on hand several sets of clips art pictures that I thought would work perfectly for this activity. I spend an afternoon coloring each one (you might want to just invest in a color version of such a set), cutting them out and gluing them onto sheets of colored paper. Of course, I laminated each on for added durability. It is important to be sure that each player sheet has a different combination of initial sounds. You’ll notice that there are very few repeating pictures in each of the sheets. This was intentional as I didn’t want my students to be able to memorize just a few icons and their beginning sounds. To play, I showed my class a letter of the alphabet and asked what sound that letter made. Then, the students looked on their own player sheets for a picture that began with that same sound. You can choose to allow all the pictures with the same initial sound to be covered at once, or to only cover one picture at a time. Me: What sound does it make? Me: Ok, what picture on your player sheet begins with /p/, /p/, /p/? Students: Milk. /m/. Nope. Pizza. /p/. Yes! As you can see, the students would go through each picture in a systematic way to find one whose initial sound matched the letter I was holding up. But…that was only after some practice. If you’re looking for something to ease your child into the game, try the reverse version. 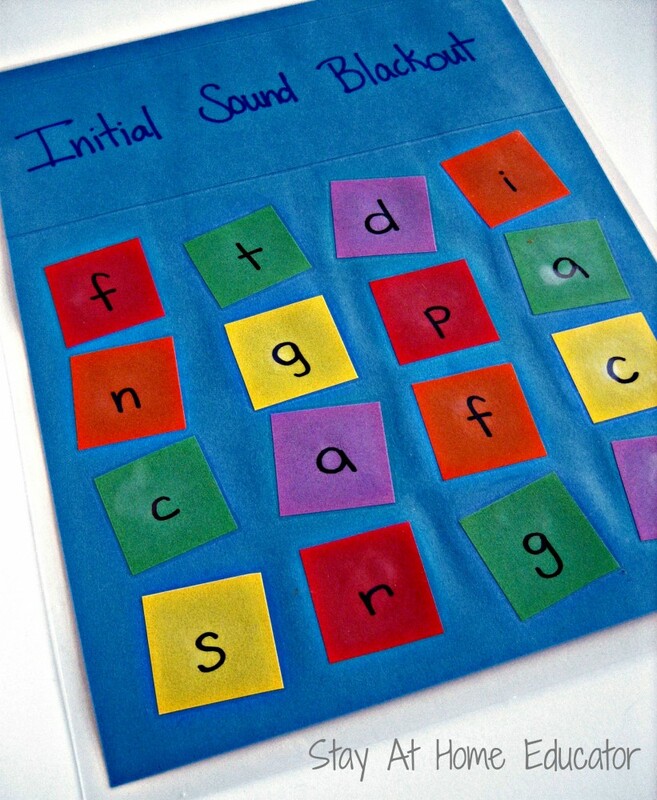 Hold up a picture card and ask your students it’s beginning sound, and then challenge them to find a letter on their player sheet that matches that same sound. I’m sure many of you are wondering about the possibility of a printable. Unfortunately, I don’t have one because I don’t have the rights to give away the clip art I used. Should you choose to make on yourself, however, and share it in this post, I will gladly link it to your TpT store. 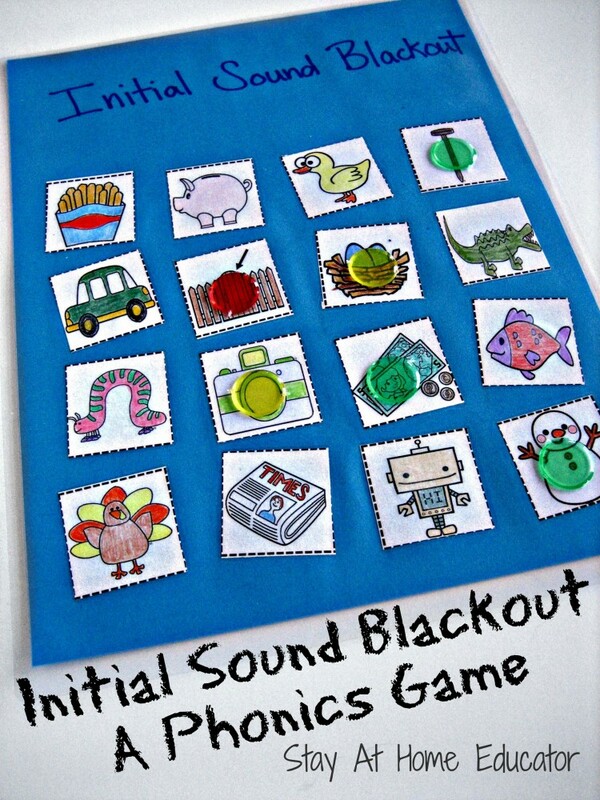 Anna from Measured Mom has created a free printable for this game! Hope on over to her website, subscribe via E-mail and keep up with all her social media updates via Facebook, Pinterest, Twitter and Google + and get your free download. She’s created eight wonderful game boards that you will love.